Background: Handheld echocardiography (HHE) has been increasingly used for rheumatic heart disease screening and in adult emergency room settings. Aims: This study aimed to validate the accuracy of HHE in the diagnosis of congenital heart disease (CHD). Settings and Design Methodology: This is a prospective study carried out at three pediatric cardiology outpatient clinics in Khartoum, Sudan. All patients with suspected CHD were evaluated by clinical examination followed by HHE, performed using a modified segmental approach. Then, a complete study was performed using a standard echocardiography machine. The results were then compared using appropriate statistical tools. Results: A total of eighty cases were included with the following diagnoses either in isolation or combination: ventricular septal defect (n = 23), atrial septal defect (n = 10), pulmonary stenosis (n = 7), tetralogy of Fallot (n = 7), patent ductus arteriosus (n = 6), atrioventricular septal defect (n = 6), transposition of the great arteries (n = 6), and other diagnoses (n = 15). Agreement between HHE and SE was excellent both for visualizing heart segments (κ =77%–100% with a mean of 92.9%) and for diagnosis of CHD (κ =66%–100% with a mean of 91.7%). The sensitivity of HHE was 69.2%–100% (mean = 90.2%) and specificity was 98.5%–100% (mean = 99.3%). Conclusion: This study supports extending the utility of HHE in children for screening of CHD in addition to its current role in rheumatic heart disease screening. Background: Electrocardiograms (ECGs) are ordered in the pediatric emergency room for a wide variety of chief complaints. Objectives: Criteria are lacking as to when physicians should obtain ECGs. 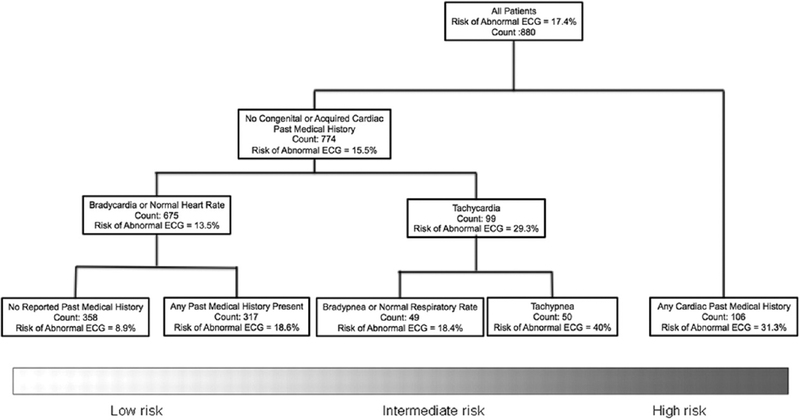 This study uses a large retrospective cohort of 880 pediatric emergency department (ED) patients to highlight objective criteria including significant medical history and specific vital sign abnormalities to guide clinicians as to which patients might have an abnormal ECG. Methods: Retrospective review of Pediatric ED charts in all patients aged < 18 years who had ECG performed during ED stay. Pediatric ED physician interpretation of the ECG, clinical data on vital signs and past medical history was collected from the medical record for analysis. Results: Of 880 ECGs performed in the ED, 17.4% were abnormal. When controlled for medical history and demographic differences, abnormal ECGs were associated with age-adjusted abnormal ED vital signs including increased heart rate (odds ratio [OR] 1.85, 95% confidence interval [CI] 1.1–3.09) and increased respiratory rate (OR 1.74, CI 1.42–2.62). In a logistic regression analysis, certain chief complaints and history components were less likely to have abnormal ECGs including complaints of chest pain (OR 0.38, CI 0.18–0.80) and known history of gastrointestinal or respiratory condition (i.e., asthma) (OR 0.48, CI 0.29–0.79). Conclusions: In this cohort of patients, those with a chief complaint of chest pain or known respiratory conditions and normal age-adjusted vital signs in the ED have low likelihood of an abnormal ECG. Background: Native aortic coarctation in young infants can be treated surgically or with balloon angioplasty, although the latter approach remains controversial. We sought to compare midterm outcomes of balloon and surgical coarctoplasty at our center and to review the current practices in literature. Methods: The study design was a retrospective record review. 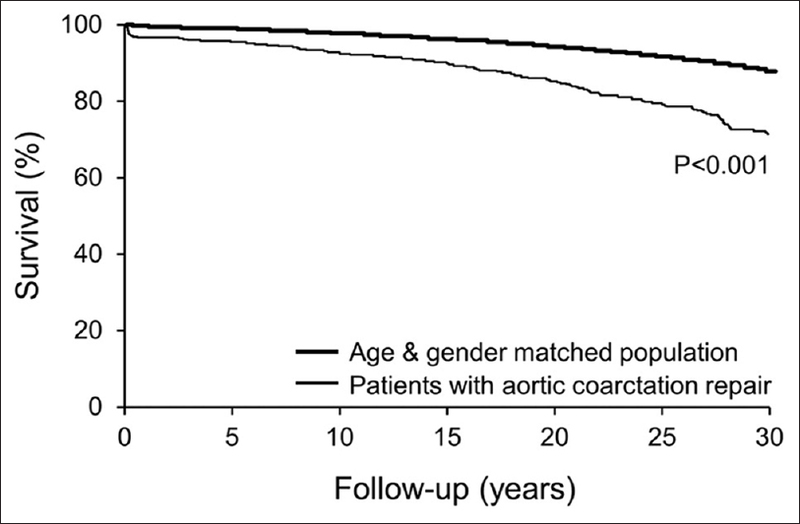 Patients with coarctation aged <1 year who underwent balloon or surgical coarctoplasty at our center (January 2010–January 2016) with >6-month post-procedure follow-up were studied. Patients with significant arch hypoplasia or interruption, long-segment coarctation, and associated intracardiac lesions were excluded from the study. Clinical, echocardiographic, and procedural details were recorded at initial presentation and follow-up. Need for reintervention was noted. Results: Out of a total of 75 patients, 28 underwent balloon (Group A) and 47 underwent surgical coarctoplasty (Group B). There were two deaths in Group B (mortality 4.2%) and none in Group A. In neonates, 63.6% of Group A and 17.4% of Group B patients required reintervention (P = 0.007). Beyond the neonatal age, 29.4% of Group A and 41.6% of Group B patients required reintervention (not statistically significant). On univariate analysis, residual coarctation on predischarge echocardiogram was the only significant predictor of reintervention (P = 0.04). On Kaplan–Meier analysis, with neonatal presentation, freedom from reintervention in Group B was significantly higher than Group A (P = 0.028). Conclusion: In neonates with native aortic coarctation, surgery unequivocally yields better immediate and midterm results and is the preferred treatment modality. 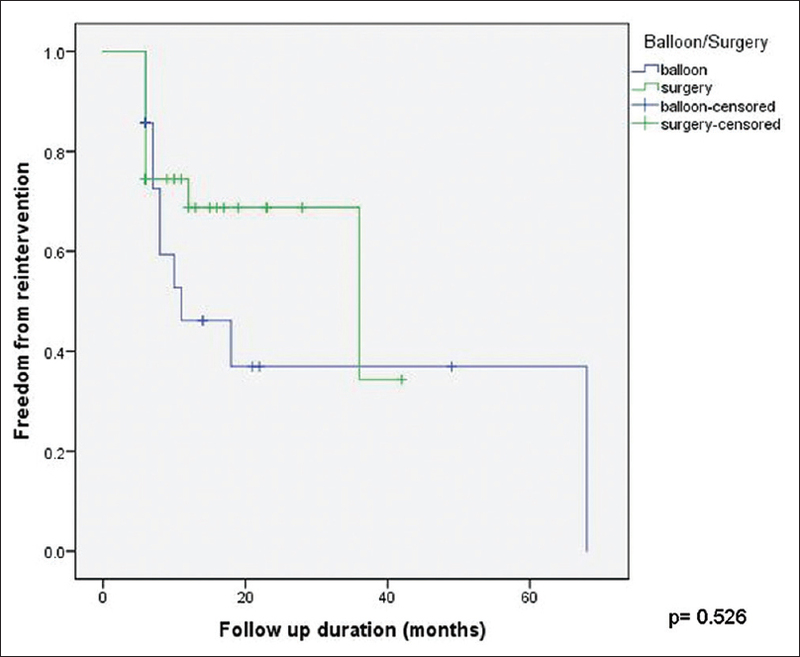 In older infants, balloon coarctoplasty has good early and midterm outcomes with acceptable reintervention rates and should be considered a viable alternative to surgery, especially in critical patients with high surgical risk. A true presubclavian coarctation of the aorta with arch hypoplasia without major intracardiac anomaly can result in a surgical dilemma. Theoretically, one can avoid repair through median sternotomy using selective cerebral perfusion and its sequelae since no major intracardiac repair is needed. 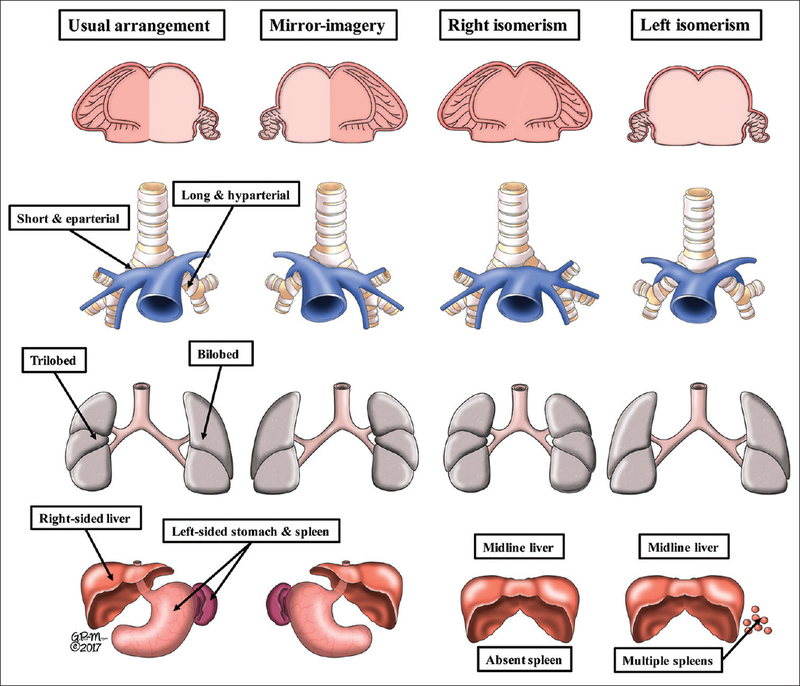 Repair through thoracotomy is technically challenging if arch reconstruction is required and precise surgical planning is required to avoid spinal hypoperfusion and to maintain cerebral perfusion. Moreover, inadequate repair often has resulted in hypoplastic aortic arch or residual coarctation on follow-up requiring future intervention. We have employed a modified surgical repair through thoracotomy avoiding cardiopulmonary bypass to address presubclavian coarctation of the aorta with diffuse arch hypoplasia with theoretically less chance for future stenosis. Compression of the left bronchus by a right-sided descending aorta arising from a left aortic arch constitutes an exceedingly rare form of vascular ring. 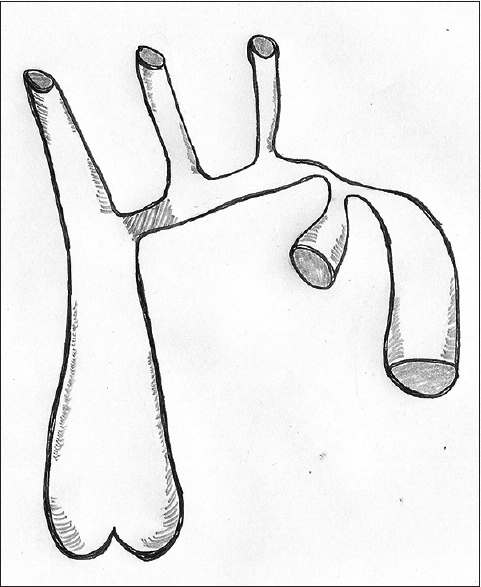 This manuscript describes the surgical technique that involves translocation of the descending aorta directly to the proximal ascending aorta, thereby relieving the bronchial compression. Background: Coarctation of the aorta (CoA) can be treated using surgery, balloon angioplasty, or stent implantation. Although short-term results are excellent with all three treatment modalities, long-term cardiovascular (CV) morbidity and mortality remain high, likely due to persistently abnormal vascular function. The effects of treatment modality on long-term vascular function remain uncharacterized. The goal of this study is to assess vascular function in this patient population for comparison among the treatment modalities. Methods: We will prospectively assess vascular Afunction in large and small arteries fusing multiple noninvasive modalities and compare the results among the three groups of CoA patients previously treated using surgery, balloon angioplasty, or stent implantation after frequency matching for confounding variables. A comprehensive vascular function assessment protocol has been created to be used in 7 centers. Our primary outcome is arterial stiffness measured by arterial tonometry. Inclusion and exclusion criteria have been carefully established after consideration of several potential confounders. Sample size has been calculated for the primary outcome variable. Conclusion: Treatment modalities for CoA may have distinct impact on large and small arterial vascular function. The results of this study will help identify the treatment modality that is associated with the most optimal level of vascular function, which, in the long term, may reduce CV risk. We report a patient with l-transposition of the great arteries who developed perioperative complete atrioventricular block at 5 years of age in conjunction with a modified double-switch operation, but had unexpected late recovery of normal sinus rhythm months later. This case highlights that even for patients with l-transposition, which is particularly vulnerable to developing both spontaneous and perioperative complete atrioventricular block, late recovery of atrioventricular node conduction may still be possible after surgery. Thrombosis and systemic embolization are important complications of extracorporeal membrane oxygenation (ECMO). We present a 2.5 kg neonate born at 37.4 weeks with hypoplastic left heart supported on ECMO that developed an acute, occlusive distal aortic thrombus that was emergently managed by transcatheter Angiojet® (Boston Scientific, Boston, MA) thrombectomy. The procedure successfully restored perfusion to the lower extremities with sustained result upon 1-week follow-up. This case highlights the Angiojet® thrombectomy as a treatment option for limb- or organ-threatening acute thrombus in even the most complex ECMO patients. A term baby presented on the 7th day of life in cardiogenic shock due to vein of Galen aneurysmal malformation. A successful embolization of the malformation was performed through transarterial route on day 12 of life after a period of initial stabilization. 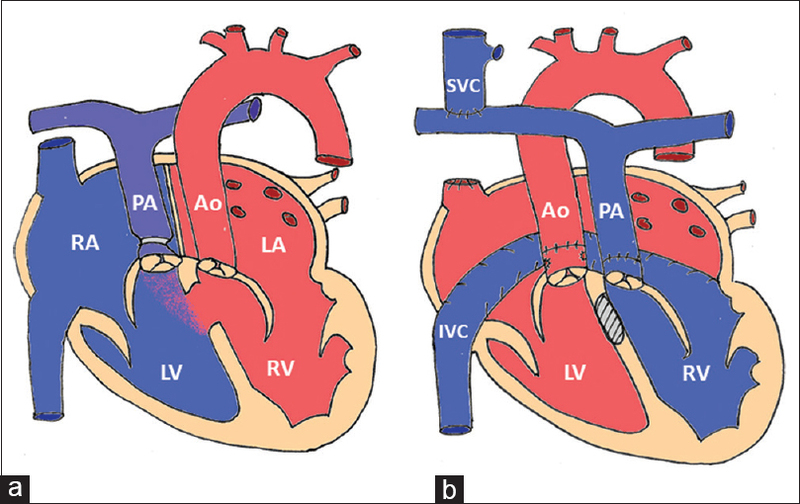 An intramural ventricular septal defect (IVSD) is a type of interventricular communication that can occur following biventricular repair of a conotruncal malformation. There have been no previous reports depicting the actual pathologic anatomy of this defect. We describe two cases of IVSDs with their clinical imaging and postmortem pathology. We report a case of a 6-year-old female child with Takayasu's aorto-arteritis (TA) with severe coarctation of the aorta which resulted in an aortic dissection post-ballooning. This happened despite ensuring that markers for disease activity were negative, with appropriate corticosteroid therapy started before the procedure, and using a low-profile, low-pressure, and slightly undersized balloon for dilating the stenotic segment. It required immediate endovascular stenting to tide over the crisis. Following the procedure, she became normotensive with well-palpable lower limb pulses. Supravalvular aortic stenosis as an early complication of transposition of the great artery repair is rare with few cases reported. Furthermore, transcatheter intervention is uncommon as surgical re-intervention has been traditionally done. We describe two cases of supravalvular aortic stenosis at the anastomotic site as an early complication of the arterial switch operation. Both patients underwent balloon angioplasty of the supravalvular aorta with improvement in postangioplasty gradients and angiographic appearance. Both patients at short-term follow-up had persistent improved gradient without need for further intervention. We are reporting the case of a newborn with a diagnosis of frequent supraventricular extrasystoles, up to 25% of beats at Holter monitoring, and partial response to beta-blockers. Initial echocardiographic studies were normal until the identification of a right atrial mass at 4 months of life. Given the progressive growth of the mass and the suspicion of myxoma or thrombus in the magnetic resonance study, surgical resection of the tumor was performed. The surgical specimen was histologically diagnostic of rhabdomyoma. Currently, the patient remains asymptomatic after a 6-year follow-up period. 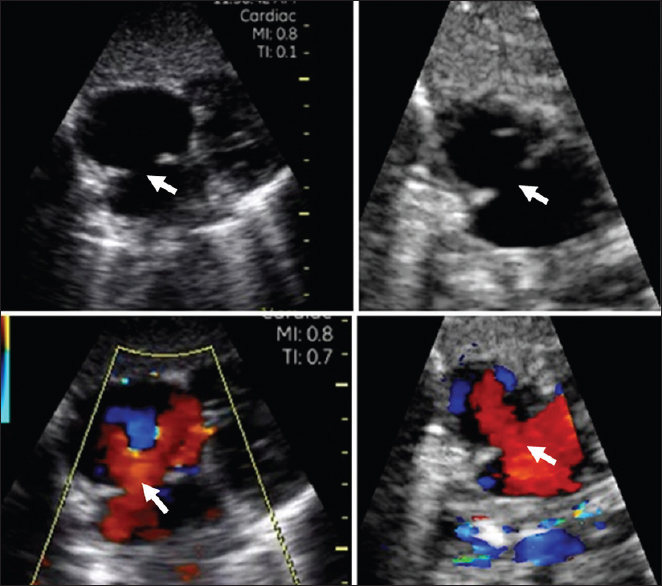 A single rhabdomyoma is described, located in an atypical situation, near the crista terminalis, and diagnosed from frequent extrasystoles which appeared before the echocardiographic resolution was able to identify it. Magnetic resonance showed nondiagnostic tissue enhancement characteristics. The association of aortopulmonary (AP) window with total anomalous pulmonary venous connection (TAPVC) has so far not been reported. 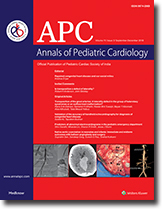 We report a unique case of an 8-month-old child who presented with congestive cardiac failure and severe pulmonary arterial hypertension. 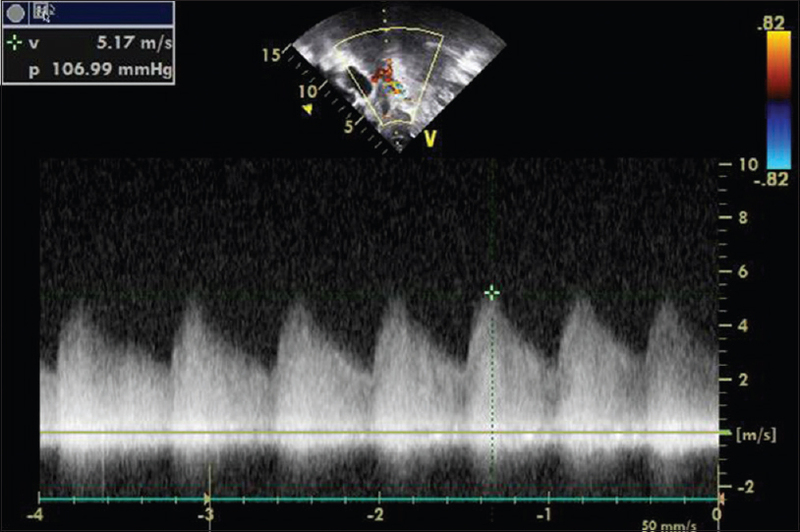 Initial echocardiography revealed supracardiac TAPVC. Cardiac computed tomography showed the presence of Type I AP window along with the TAPVC. In the presence of severe pulmonary hypertension and dilated right ventricle, AP window may easily be missed if not actively looked for. Anomalous origin of the right coronary artery (RCA) from the pulmonary artery is a rare entity that causes chronic left-to-right shunting of blood from the RCA, through the coronary collaterals into the pulmonary artery. This results in persistent myocardial ischemia and ventricular dysfunction. Association of this anomaly with an aortopulmonary window worsens the condition further due to an additional shunt. We encountered a combination of these two anomalies along with an ostium secundum atrial septal defect in a 10-month-old baby who presented with excessive crying and failure to thrive. 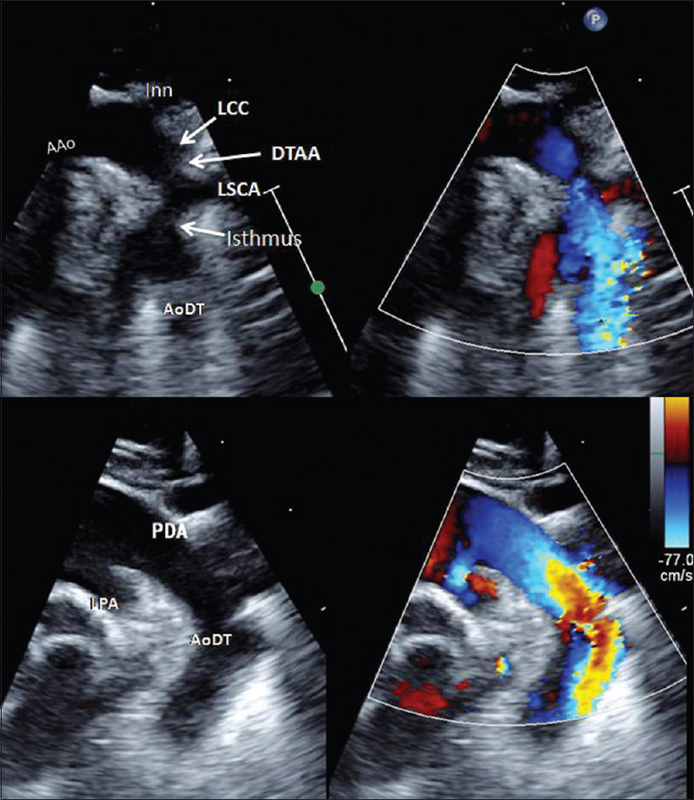 Evaluation by transthoracic echocardiography and cardiac computed tomography scan confirmed the diagnosis. 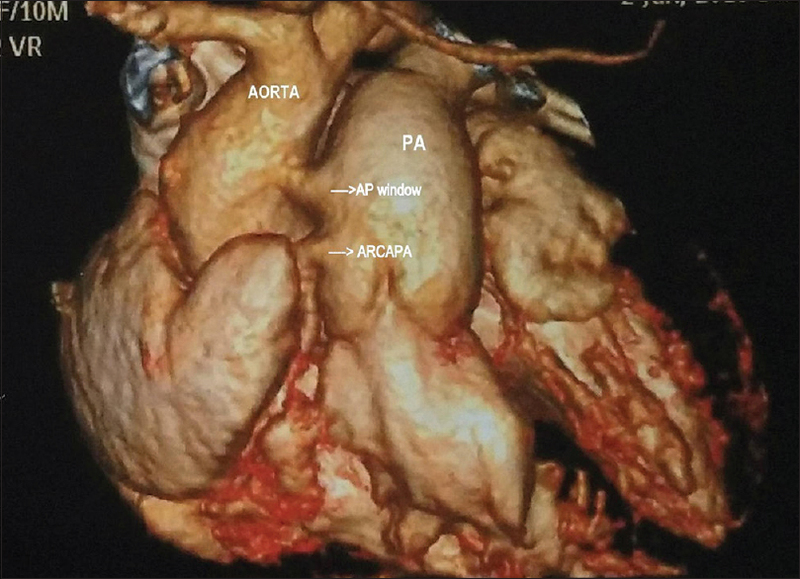 Intrapulmonary baffle was done using a pericardial patch to connect the RCA origin to ascending aorta through the aortopulmonary window, similar to Takeuchi procedure. Concomitantly, ostium secundum atrial septal defect was also closed. A 2-month-old baby with ventricular septal defect and pulmonary atresia was found to have coronary-to-pulmonary artery collaterals. Cardiac computed tomography confirmed the coronary collaterals and showed the absence of other systemic to pulmonary artery collaterals. 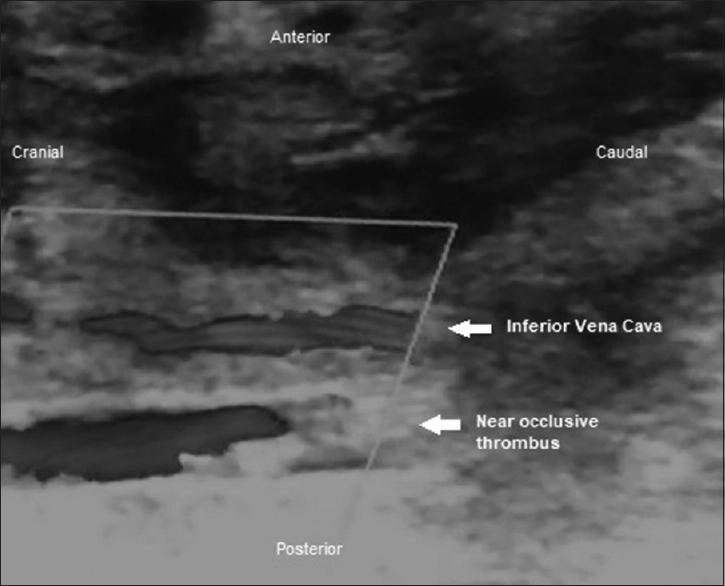 Although these collaterals do not cause coronary ischemia, it is important to delineate them by accurate imaging to plan the appropriate surgical strategy.